This is a conservative energy-saving simulation for air-conditioning systems after the installation of PERFECT 70. 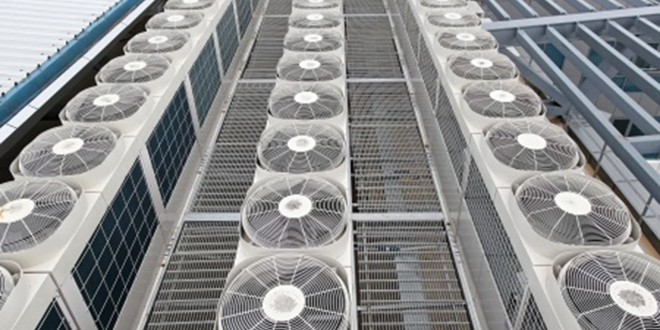 Other factors of air-conditioning system cooling-efficiency includes climate conditions, window framing, wall coverings, room air-leakages, glass type, internal shading of windows(curtains, blinds), exterior shading of building, etc. Operating hours of the air-conditioning systems can severally distort the energy-saving estimates; increased usage of air-conditioning at night will reduce the average cooling load energy-reduction as night temperatures are usually lower. Climatic factors such as mean temperatures, seasonal windspeeds, sunshine hours, geographical altitude, etc are used for estimating the peak solar gain on glazings. These factors varies in different times of the year. 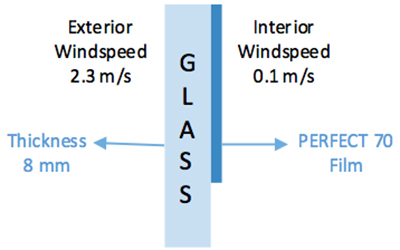 Additional energy-consumption for interior lightings, due to daylight-loss (after tinting) is not taken into consideration as PERFECT 70 is visually-clear window film. Results are not provided for darker glass, dual-panes, other thickness or other insulated glass as the optical properties and thermal insulations of these products varies among different manufacturers. Based on 2012 International Energy Conservation Code, the fenestration area is limited to 40% of the wall area, if ≥50% of the floor area is in a daylight zone and glazing is above 1.1 for VT/SHGC ratio. Optimum indoor temperature for air-conditioning is set at 24 °C according to WWF recommendation. The above energy-saving estimates are tabulated from computer stimulations of energy consumption reduction in air-conditioning systems after the installation of window films, using proprietary green-building software, co-developed with Japanese counterparts. These results are provided for comparison purpose, and by no means guarantee any specific performance due to the wide array of factors involved in the calculation of carbon emission reduction. Neither, Perfect Window Films PTE LTD, nor its representatives, affiliates or any person acting on behalf of Perfect Window Films PTE LTD, makes any form of guaranteed representations or warranties, whether expressly or implied, based on the above results, including data accuracy and performance guidance of any specific product’s merchantability, usage and fitness of a particular purpose. Neither, Perfect Window Films PTE LTD, nor its representatives, affiliates or any person acting on behalf of Perfect Window Films PTE LTD, shall be liable for any form of losses or damages, in contract, performance expectation of product, tort or whatsoever due to reliance and/or usage of the above results, in whole or in part, by any entity or person for any reason.